I am a little obsessive. I made a no-knead artisan bread recently and I was so excited at the idea of a no-knead bread that I used the same recipe to make a rosemary foccacia. I was really happy with how simple the entire process was. The recipe is great, especially because it is so forgiving - I can let the dough sit and rise for anywhere between 12 to 24 hours and make the bread when I am ready. But what if I can find a bread recipe that requires no kneading AND can rise in a much shorter time? Well, the problem with wondering about things is that it was only a matter of time before I goggled for an answer. And it being the wonderful world that it is these days, yes, you guessed it, I found a recipe for bread that requires no kneading, and that I can bake in all of 2.5 - 3 hours from start to finish! The best part? It is a gorgeous-yummy loaf of bread. To make this bread, I did the usual - measured the correct amounts of flour (just simple plain flour - no bread flour required! ), salt, sugar and instant yeast into a big mixing bowl. Then I added water and mixed everything until it all came together. I placed a damp towel over the bowl, and left it on my stove. The dough was ready in 2 hours. Then with a fork, I pierced the dough. And with another fork, I separated the dough into two portions. I buttered a loaf tin - be quite generous with the butter. It makes the bread so aromatic. I placed the dough in loaf pans, and used my fingers to press gently on the dough so it sort of spread a little. I rolled the dough in the pan so all sides were coated with butter. I let the dough rise for another 20-30 minutes (covered with damp towels). Finally, I baked the bread. And when they were done, I transferred the loaves onto a cooling rack. I used the bread to make ham and egg sandwiches for lunch. You can spread butter, jam, what ever you want on the bread and have it for breakfast, or make sandwiches with them. In fact, my mom remarked that it would be fantastic with chicken curry! It is so freaking good. I am going to use this recipe a lot more. How quickly time flies! I started blogging last May/June and this is my 200th post! To celebrate, I am giving away one 14" Danish dough whisk each to TWO lucky readers! To participate, click on the link below! 1. 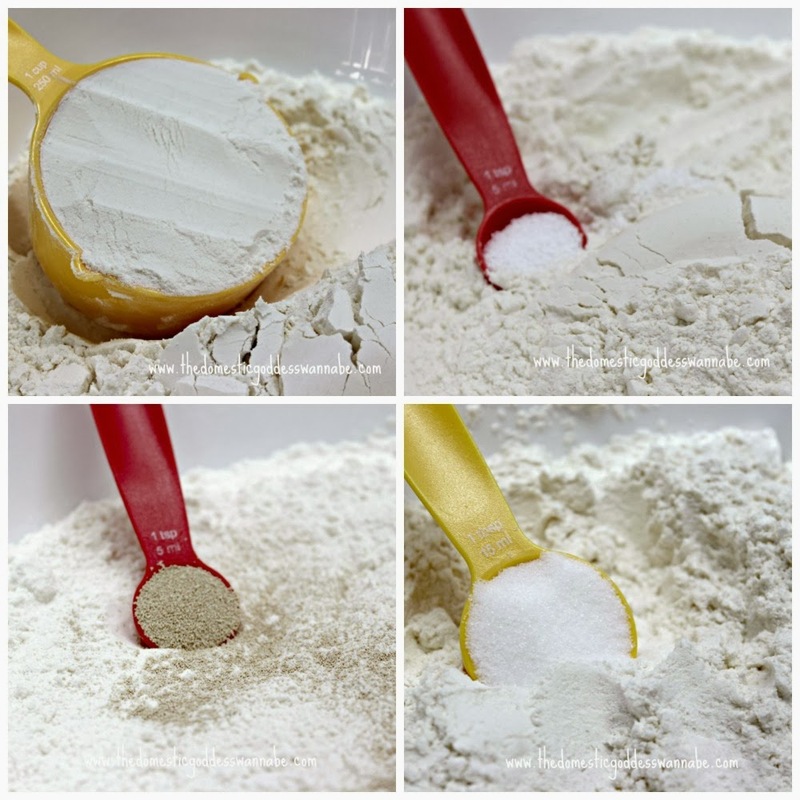 Place all dry ingredients (except water) in a large mixing bowl. 2. Add water and mix until dough comes together. 3. Cover with a damp towel and place the bowl in a warm place until dough doubles in size. 4. Prick dough with a fork. Separate dough into 2 equal portions. 5. Generously butter 2 loaf pans and gently spread dough with fingers. The dough does not have to touch all sides of the pan. You can also use round pans if you wish. Let dough rise for another 20-30 minutes. 6. Pre-heat oven to 220C. (I use a conventional oven.) Bake bread for 15 minutes. Reduce temperature to 180C and bake another 15 to 20 minutes. Keep an eye on the bread in the final 5 minutes. 7. Transfer onto cooling racks to cool. 8. Bread can be kept wrapped for 2-3 days. Warm in microwave oven to soften before eating. I like roast beef sandwich. I am so going to try this out ! thank u !!! Yummy!! I need to try bread making soon! I like philly cheese steak sandwich. My dad used to make really good ones! Gonna try this. I always fail in my bread making. This looks so easy. Hope I can bake it right. I love egg mayo sandwich. 1. the 2tbsps room temperature butter is for buttering the loaf pan? 2. how should i adjust the water amount if i want to mix in some wholemeal flour? Hi the butter is for buttering the loaf pans, yes. I am not sure about wholemeal flour - I have not tried it before. Perhaps you can google and see what other say? I love baguettes and egg mayo sandwiches! May I know where did you purchase this dough whisk? Thanks!